The information you are viewing for this event is from Monday, Dec 31, 2018. Free Cab Ride Home program is a service that has been provided for over a decade in an effort to reduce the incidents of drinking and driving in the communities they serve, especially during celebratory times. 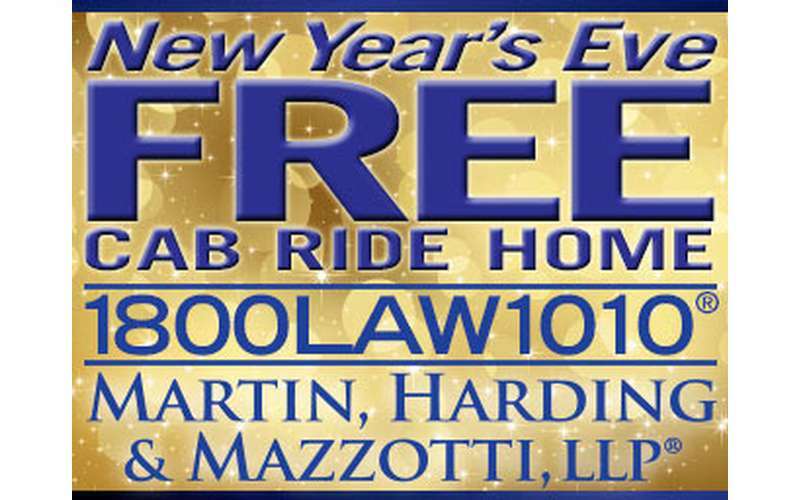 Martin, Harding & Mazzotti, LLP provides free cab rides home to those who have been drinking, on a "no-questions asked" basis. This service has provided thousands of safe rides home since its inception and will continue to keep our communities safe this New Year's Eve. Free Cab Ride Home Areas: Albany, Schenectady, Troy, Saratoga Springs, Amsterdam, Fulton and Montgomery County, Utica, Plattsburgh, NY, Burlington, VT and Springfield, MA. To get your free cab ride home simply call the toll-free number 1800LAW1010 or 1.800.529.1010.